The Minto-Mapleton FHT (MMFHT) will demonstrate excellence in delivering comprehensive, patient-centred rural primary care. The MMFHT is a collaborative, interdisciplinary team of providers located in Minto (Palmerston, Harriston and Clifford) and Mapleton (Drayton). Our mission is to efficiently provide high quality, accessible, patient-centred primary care with a particular focus on chronic disease management and disease prevention to maximize health and well-being. Teamwork: We work in interdisciplinary teams of health care professionals to meet the needs of our patient population. Community partnerships: We work in collaboration with our community partners including other health care organizations and professionals. Realistic and Responsive: We strive to develop MMFHT programming and services based on the changing needs of our patients. Evidence-based practice: We are committed to developing and using evidence-based practice and continuous re-evaluation to guide our services and measure our results. Innovation: We use creative solutions that respond to local community and provider needs to achieve the MMFHT objectives. Research and education: Research and education opportunities are embraced and encouraged for all staff. Patient-centred: We encourage patient self-management by providing direction, education and support. Through this partnership we promote a culture of mutual trust and accountability. The following 7 revised strategic goals will guide the work of the MMFHT over the next few years. The goals were developed through the following process steps: environmental scanning, board/staff strategic planning workshop, feedback from board and staff on draft goals and objectives. 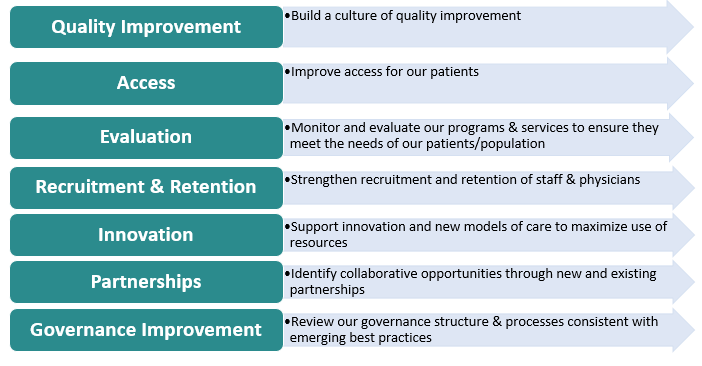 The Quality Improvement Plan (QIP) has been developed to meet the requirements of the Excellent Care for All Act and to demonstrate to the community our commitment to quality, responsive, and accountable rural primary health care. The QIP aligns with the Minto-Mapleton Family Health Team's (MMFHT's) strategic directions and Annual Plan. The QIP, in addition to other quality improvement strategies, continues to play an important role in helping the FHT better understand our patients' experiences at the FHT with the goal of improving the quality of care and overall experience. The Minto-Mapleton FHT's 2019/20 QIP will focus on four (4) quality themes: 1) Timely and Efficient Transitions 2) Service Excellence/Patient Centred Care 3) Safe and Effective Care and 4) Equitable Care. Our efforts for the Timely and Efficient Transitions theme will focus on two areas: continuing to improve the transitions for patients discharged from hospital back to their home with a specific focus on patients with Chronic Obstructive Pulmonary Disease (COPD) and Heart Failure. We know that we can do a better job supporting our patients with the goal of preventing unnecessary hospitalizations. We want to also continue to monitor how long it takes patients to get an appointment with their physician or nurse practitioner particularly given our offices are nearing full capacity. Some of our primary care providers are embracing technology to help patients access their care in a more timely and accessible way and we are excited to see how we can grow this "virtual visit" offering for some of our patients. The 2019/20 Plan continues to value input from our patients about their experiences with their primary care practitioner/clinics with the objective of involving patients in decision making about their care. We will continue to expand the ways we seek patient input, and share the feedback we receive, so that patients know what improvements we are working on. We are also still in the early stages of email communication with our patients and will continue to expand this option for patients. The Family Health Team will be looking at a new focus area this year under the Safe and Effective Care theme. We will be trying to understand some of our physicians' and nurse practitioners' prescribing practices of opioids to patients who are not palliative. One of our goals is to make sure our providers have access to the most recent evidence for prescribing opioids for chronic pain and to offer accurate, up to date information to our patients about opioids and pain management, including programs the FHT offers to support patients with chronic pain. The Equitable Care theme will involve work in two areas: working to improve our childhood immunization rates and our colorectal screening rates. For some time, we have noticed that our childhood immunization rates are not improving. We are going to take some actions aimed at improving these rates, such as: 1) using reminders to parents for up and coming and missed vaccinations (including electronic reminders) 2) accessing provider resources on educating parents about the importance of childhood vaccination and 3) providing data to physicians and nurse practitioners on children in their practices who are not up to date with their vaccinations. While we have been making some steady improvements with colorectal screening rates among our patients, we recognize that we can do better. A new test, called the FIT test, is scheduled to be launched in June, 2019 and the FHT is going to try to promote this "more patient friendly test" for colorectal screening in our offices. We will aim to provide patients and their providers with information about the new FIT test and modify a tool that we use in our Electronic Medical Record system to notify providers of patients who are due for colorectal screening. The MMFHT has 5 practice sites where primary care is offered: Drayton, Palmerston (2 sites), Harriston and Clifford. • Communicate findings, quality improvement progress and lessons learned. The 2019/20 QIP is the 7th QIP that the Minto-Mapleton FHT has developed. We continue to remain committed to tracking our progress and working towards achieving our QIP objectives with the overall goal of improving patient care. Our FHT has been continuing to work on improving our cancer screening rates, especially colon and cervical cancer screening. We have been trying to use our Electronic Medical Record (EMR) system to improve our data quality of cancer screening reports. A process was implemented using an Excel program to compare the data of patients overdue for their cancer screening in Telus Practice Solutions (PS) with Cancer Care Ontario’s Screening Activity Reports (CCO-SAR). This process was completed for all physicians with a focus on Breast, Cervical, and Colorectal screening since these are the three categories that are available on CCO-SAR and align with our two of our QIP indicators. To complete this comparison, a staff member exports reports from each location and uses a program to compare the differences between the two lists. If a patient was on PS’s overdue list but not on CCO-SAR’s, this could mean that the patient was either up to date for screening or excluded from being eligible to be screened for various reasons. If the patient was up to date on screening according to CCO-SAR, the report was located, properly categorized, and inserted into the patient’s chart or a note was made that screening was completed. We are finding that this process is very helpful and we are starting to see some screening rate improvements. We created posters that shared the results from our patient survey this year for each office so that each office could share the results with their patients. These posters included the percentage of patients who feel involved in decisions about their care and treatment; patient perceptions on the amount of time they have to wait to get an appointment; satisfaction with the quality of care at their physicians and nurse practitioners' offices; and perceived ability to receive timely care when there is an URGENT health condition. We also shared plans for improvement in each office on the posters, such as “continuing to improve our cancer screening and immunization rates” and “exploring electronic communication options such as email with our patients”. This helps us to communicate back to patients the importance of their feedback and gives patients a heads up on the kinds of quality activities the office is planning. We will continue to include our patients in our quality improvement initiatives this year through our patient surveys at our 9 physicians' and 3 nurse practitioners' offices. In some of our offices, we are offering patients the choice of completing surveys on paper or electronically on tablets. We recently partnered with the Town of Minto and plan to reach out to community residents this coming year through "Engage Minto" which is an online process designed to solicit and capture community input on specific topics. We will continue to produce our patient posters and will be highlighting up and coming quality improvement initiatives on these posters. The Minto-Mapleton Family Health Team is committed to building and preserving a safe working environment for its staff. The FHT assesses risk factors in the workplace to identify workers who may be exposed to violence. In conjunction with staff, the FHT's health and safety representatives regularly review our Violence Policy and Program to minimize or eliminate the risks of violence in the workplace. Any incidents of workplace violence are reviewed by the FHT's health and safety representatives to ensure concerns have been dealt with and to make recommendations to reduce or eliminate risk of violence. The FHT is also committed to training and informing staff on the contents of the Violence Policy and Program to ensure that staff are knowledgeable of the risk factors and how to eliminate or respond to violent situations. A health and safety update including any Workplace Violence incidents is provided to the FHT Board at least annually by the FHT's Executive Director.